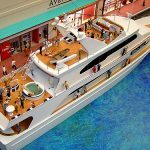 Nautical Models – SMARTT: Scale Models, Arts, & Technologies, inc.
A contemporary model ship lends an air of class to any den, office, or living room. Cargo ships or yachts, speed-boats or barges, SMARTT has experience building just the right modern nautical model to suit your display needs. SMARTT can build or customize one of the many commercially available kits, or scratch-build your dream vessel. Copyright © 2017 Scale Models, Arts, & Technologies, Inc.